MALAYSIA became party to the WHO Framework Convention on Tobacco Control (FCTC) in 2003. FCTC Article 15 enumerates in detail measures to tackle illicit trade in tobacco products. Although the relevant authorities have been discussing the illicit trade in tobacco products, including preparation for the ratification of the Protocol to Eliminate Illicit Trade in Tobacco Products (ITP) by Malaysia, there seems to be lack of or even absence of serious and effective measures to stop the reportedly growing illicit trade in tobacco products so far. Article 15.7 of the FCTC calls for licensing to control or regulate the production and distribution of tobacco products in order to prevent illicit trade. The National Kenaf and Tobacco Board Act 2009 amendment in 2010 stipulates licensing of tobacco and tobacco products. Licensing of Tobacco and Tobacco Products Regulation 2011 has yet to be implemented amid continued opposition by the tobacco industry. We must be reminded that the provision on the ban of kiddie packs under The Control of Tobacco Product Regulations 2004 was also delayed for over six years due to interference by the tobacco industry. With such blatant disregard to legal provisions and international treaty obligations, the tobacco industry’s typical threats of loss of employment, loss to tobacco farmers, increasing illicit cigarettes and now the increased use of illicit cigarettes by young smokers become the emotive justification by the industry and the front groups in chorus to blind and blinker all the public healthcare professionals’ expert recommendations. Cigarette retailers and the cigarette companies are not a stakeholder in deciding public health policies. They have vested interest in the sale and promotion of tobacco products. WHO reports link direct and indirect involvement of the tobacco industry in the smuggling and illicit trade of tobacco products. As such, they have no credibility and their proposal aims only to guarantee benefits to them. Instead of entertaining regressive ideas and proposals, all related parties should be tightening the tobacco products supply chain under the Blue Ocean Strategy. For a start, immediately institute a ban on sale of tobacco products at places other than permanent premises. This measure was successfully used to tackle pirated CD/DVD sale by local governments before. Hasten the implementation of licensing of tobacco and tobacco products by National Kenaf and Tobacco Board. The Royal Malaysian Customs at Kuala Lumpur International Airport (Klia) crippled an attempt to smuggle in 2.56 million sticks of cigarette and 7,560 kg of chewing tobacco on Sunday. The consignment was valued at RM400,000 with unpaid taxes amounting to RM2.2 million. Klia Customs director Datuk Hamzah Sundang said three lorries and three local men aged between 26 and 34 years were intercepted at the cargo inspection section. “The three lorries were found to be loaded with cigarettes and chewing tobacco without any declaration document to allow them to pass through the Klia customs cargo gate,” he told a media conference here today. He said the three men had been remanded for seven days to assist in the investigation under Section 135(1)(a) of the Customs Act 1967. Hamzah attributed the success of the case to the Coordinated Border Management (CBM) operation launched on Jan 15 to curb leakages and smuggling activities. He said throughout the CBM operation conducted at the Klia Free Trade Zone, 30 cases of wrongdoing were recorded, of which 29 were issued compounds and one, prosecuted in court under the Customs Act. JAMES Bond isn’t the only one with a licence to kill. The World Health Organisation reports that smoking costs the global economy RM4.5 trillion a year, and will take eight million lives annually by 2030. For a species that has invented fire, travelled to space and split the atom, we are still paying an industry to kill us. Mankind is indeed strange. Decades of research have shown that smoking can be fatal. So, we are often asked: if cigarettes cause such harm, why are they allowed to exist? One challenge is the separation of the problem — the health industry sees tobacco as a health issue, while businesses and governments see it as an economic driver. But the same WHO report also states that the cost of smoking far outweighs the revenue from tobacco taxes. Treating smoking-related diseases drives up the cost of healthcare. In 2005, Malaysia’s Health Ministry spent 26 per cent of its budget to treat those diseases, which accounted for 0.74 per cent of its gross domestic product. There are also the environment, productivity and human development — smoking pollutes our air and water, and smokers are 30 per cent more likely to miss work (for longer periods, too). In some families, money for cigarettes is taken from household essentials. No other industry causes as much damage to its users and non-users alike — and remains legal. Instead of protecting this industry, we urge the nation to support tobacco control efforts in Malaysia. Tobacco control can work. A study published in the United States this month reports that efforts since 1964 had resulted in eight million fewer smoking deaths. We should want the same for our fellow Malaysians. As people become more aware of the dangers of smoking, many have taken steps to reduce the number of cigarettes smoked or to stop the bad habit. Public and private health centres and pharmacies provide smoking- cessation services, which include evidence-based treatment. These studies were based on large-scale population with medication that has been proven to be safe and effective. Nicotine replacement therapy (Nicorette) and Varenicline (Champix) have been used by those who wanted to quit smoking, and they have done so. Interestingly, there is not much evidence supporting e-cigarette use as an alternative method for smoking cessation. Recently, the Institute of Public Health, Health Ministry, conducted a survey on the use of e-cigarettes among adolescents and adults in Malaysia (The Tobacco and E-cigarette Survey among Malaysia Adolescents and The National E-Cigarette Survey 2016). The results were disturbing. The majority of those who use e-cigarette are dual users. This means that they smoke cigarettes and e-cigarette. This is hazardous as it may result in nicotine overdose, which can lead to death. This can strengthen their addiction to nicotine, which hooked them to cigarettes in the first place. Almost 70 per cent of the dual users stopped e-cigarette but continued smoking conventional cigarettes. Most school children and adolescents started using e-cigarettes out of curiosity. The main pull factors were the flavours and smell of e-liquids. Many other dangerous substances can be introduced by drug pushers and dealers by just lacing the liquids. Nearly 75 per cent of the study population felt that e-cigarettes were not useful to stop smoking and more than half wanted these to be banned. Using e-cigs to quit smoking? A NEW study reveals that 95% of Malaysian vapers surveyed have either quit or cut down on smoking, while over 80% of them reported improved health. “More than two-thirds stopped smoking all together. Among the 27% that didn’t quit, the average consumption of cigarettes dropped from 19 to four a day,” Greek cardio­logist Dr Konstantinos Farsalinos said at a recent interview in Kuala Lumpur. Sharing the results of his latest study, the Onassis Cardiac Surgery Center and University of Patras researcher says over 7,000 adult vapers – 97% of whom were male – participated in the online survey which was in English and Malay. The average age of respondents was 30. Over 5,500 ex-smokers and more than 1,500 smokers, who are also vapers, were asked about their experiences with e-cigarettes, and the results were consistent with those from the United States and Europe. This, Dr Farsalinos claims, is the largest cross-sectional survey of adult vapers in Malaysia and Asia. The survey is an extension of his 2014 study involving over 19,000 participants worldwide. While his earlier study on the characteristics, side effects and benefits of e-cigs found that 81% of those surveyed had quit smoking with e-cigs, he admits that there was little participation from Asia. The Malaysian survey, he says, fills the gap. “The vaping community here is more organised compared with those in other countries in the region. They reached out to me early on. There are lots of questions but no data so it was important to do a study here,” he says, explaining why he decided to conduct his latest survey in Malaysia. The lack of data, he feels, is why e-cigs are feared. While admitting that some fears are legitimate, he argues that sound policy must be based on facts and data, not fears. The most common side effect of vaping is dry throat and mouth, he says, dismissing fears that smoking e-cigs would lead to addiction. According to his findings, tobacco cigarettes were the first nicotine product used by 92% of the respondents while 95% denied ever using e-cigs to inhale anything other than e-liquids. The Health Ministry’s recommendation for e-cigs to be strictly regulated as a pharmaceutical product is a “big step backward”, says Dr Farsalinos, arguing that whether the e-cig is a pharmaceutical, tobacco or consumer product was dealt with in Europe three years ago. He believes the devices should be regulated as a consumer product but with restrictions, like banning its sale to minors. “Smokers aren’t stupid. They know their habit causes diseases that kill but they like it. Smoking is pleasurable. E-cigs give them the same pleasure. “Malaysia adopts harm reduction when they tell motorists to wear a seatbelt. Why is this different?” he asks, adding, however, that e-cigs should only be the option for those who failed to quit smoking by themselves or after they’ve tried medication. Prof Datuk Dr Abdul Razak Muttalif believes it’s better to err on the side of caution as the long-term effects of e-cigs on the body are still unknown and may take years to find out. He is the chairman of the Health Ministry’s technical committee tasked with studying the health effects of e-cigs and shisha smoking and also a senior consultant chest physician and former director of the Kuala Lumpur Hospital Institute of Respiratory Medicine. “Look how long it took before we knew that cigarettes cause diseases. As doctors we are very careful,” Dr Abdul Razak says when asked to comment on the Farsalinos study. When the committee was formed in 2013, there wasn’t much data on e-cigs, he says, but some studies now show that e-cigs could have acute and long-term effects on consumers. Worried about the nicotine in e-liquids, he warns that it could lead e-cig users to other addictions. Universiti Malaya nicotine addiction specialist Assoc Prof Dr Amer Siddiq Amer Nordin is also concerned. “A single survey conducted on mainly Internet users is inadequate to change the understanding of the danger or benefits of e-cigs. Besides the ongoing national study findings, there are a number of studies looking at the prevalence, mode of use, safety of e-liquids and safety to the environment. These are conducted by local universities. Let’s compare their data with Dr Farsalinos’ data. “If e-cigs are found to be a useful quit-smoking agent in future, it should be regulated as a medicinal device. Still, abstinence is the best way to quit,” he says, adding that nicotine is governed by the Poison Act and its distribution is controlled. Calling for a ban on e-cigs, the Consumers Association of Penang (CAP) believes that instead of helping smokers quit, e-cigs just cause them to spend more on a new habit. CAP education officer N.V. Subbarow insists that many vapers are still smoking. CAP, he says, conducts weekly consumer education programmes in schools, addressing topics like vaping and e-cigs. British American Tobacco (M) Bhd’s (BAT) second-quarter financial performance was hurt by the continued impact of the November 2015 excise-led price increase, as well as the reduced consumption during the fasting month. The company remains concerned with legal volumes continuing to be impacted by the current rampant illegal cigarette trade after the unprecedented excise increase in November last year that saw consumers down-trading within the legal market. It cited a market research done by the Confederation of Malaysian Tobacco Manufacturers last December that discovered close to one out of two packs of cigarettes sold in the country was illegal. The company said in a press release that the total legal domestic market experienced a volume decline of 26.3% in the first half of 2016, and pursuant to that, it saw a contraction in its domestic and duty-free volumes by 28.9% versus the first half of last year. “The overall volume reduction and its consequent escalating cost pressures resulted in a total revenue decline of 16% and gross profit of 21.5%, both when compared to the first half of 2015. “This fall in volumes is principally driven by the steep excise increase in November 2015 and the industry has yet to see any signs of recovery,” said BAT managing director Erik Stoel in the press release accompanying the results. The company saw its second-quarter to end June net profit declining 78.2% year-on-year (y-o-y) to RM47.72mil, while revenue also saw a y-o-y drop of 11.5% to RM962.58mil. The company has declared a dividend of 45 sen per share, which was a decline from the 78 sen per share dividend in the same period a year ago. Experts have expressed their concerns over a recent survey on the implied benefits of e-cigs or vaping. A researcher said 95% of Malaysian vapers surveyed have either quit, or cut down on smoking, while more than 80% of them reported improved health. “More than two-thirds stopped smoking altogether. “Among the 27% that didn’t quit, the average consumption of cigarettes dropped from 19 to four cigarettes per day,” Greek cardiologist Dr Konstantinos Farsalinos, a researcher at the Onassis Cardiac Surgery Center and University of Patras, told The Star. Over the 7,000 adult vapers – 97% of them males – participated in the online survey. The average age of the respondents was 30. Universiti Malaya nicotine addiction specialist Assoc Prof Dr Amer Siddiq Amer Nordin voiced his concern that a single survey conducted on mainly Internet users was inadequate to change the understanding on the dangers or benefits of e-cigs. “Let’s see the ongoing national study findings and compare with Dr Farsalinos’ data. “If e-cigs are found to be a useful quit-smoking agent in future, it should be regulated as a medicinal device. “Still, abstinence is the best way to quit,” he said, adding that nicotine was under the Poison Act and its distribution should be controlled. Over 5,500 ex-smokers and more than 1,500 smokers, who are also vapers, were asked about their experiences with e-cigs and the results were consistent with those in the US and Europe. Prof Datuk Dr Abdul Razak Muttalif, chairman of the Health Ministry’s technical committee on e-cigs and shisha, said the long-term effect of e-cigs was still unknown. “As doctors, we’re very careful,” said Dr Abdul Razak, who is also a senior consultant chest physician at the KL Hospital Institute of Respiratory Medicine. He warned that e-cigs had long-term effects and could lead to other addictions. The committee had recommended that e-cigs be strictly regulated as a pharmaceutical product in Malaysia. Describing the move as a “big step backwards”, Dr Farsalinos said whether e-cigs were a pharmaceutical, tobacco or consumer product, was dealt with in Europe three years ago. “E-cigs are not medicinal so that argument was thrown out. “The EU (European Union) regulates it under the Tobacco Products Directive but there’s a separate category for e-cigs where it’s treated as a consumer product,” he said. He added that e-cigs should be regulated as a consumer product but with restrictions like banning its sale to minors. Calling for a ban on e-cigs, Consumers Association of Penang (CAP) said instead of helping smokers to quit, e-cigs are causing them to spend more on a new habit. LOCAL tobacco players have been hit hard by the 36% excise duty hike last November, with many lamenting that the move taken by Government was not done in a “fair” manner. And should they be imposed with another round of tax hike later this year, more pain is in store for tobacco firms, as they have a harder battle to absorb costs to sustain their businesses, says JTI International Bhd (JTI Malaysia) managing director Guilherme Silva. Guilherme, fondly known as Gui, says while the move was taken to curb cigarette consumption, it wasn’t eradicating the illegal cigarette trade. “We are working in an industry that is extremely regulated and we understand the Government’s objective. “But the way it is being tackled will not solve the issue of high cigarette consumption nor help legal cigarette firms operate in such an environment,” Gui tells StarBizWeek in an interview. Tobacco players in the country have so far seen three rounds of excise hikes, with the first 14% hike in September 2013, followed by 12% in November 2014 and a massive 36% hike in November 2015. And two weeks after the announcement, British American Tobacco (M) Bhd and JTI had gone on to hike prices of cigarettes. “We are seeing the industry declining at a fast pace because of the steep increase in tax. And it’s difficult for us to sustain our business and cover costs in an environment that is already challenging,” notes the 35-year-old Brazilian, who was previously the general manager of JTI Cambodia. Gui is the youngest so far appointed as JTI’s managing director. He took over from Rob Stanworth, who moved to another JTI market in Asia-Pacific. The past six months has been tough and the continuous engagement with the various ministries hasn’t been easy, according to Gui. “If I had to highlight the difference, Malaysia is the probably the eighth country I have lived in and I have never seen such high levels of illicit trade as in Malaysia,” he notes. JTI Bhd, which lost its listing status after a compulsory takeover offer from its parent JT International Holding BV, has three cigarette brands in its portfolio – Mevius, Winston and Camel. After the November 2015 excise hike, JTI enforced a 23% to 25% hike on its cigarettes. A pack of 20 sticks of Mevius, Winston and Camel now cost RM17, RM15.50 and RM16, respectively. Despite the high taxes, he says cigarette consumption has been on an increasing trend. As of 2015, a study conducted by the Health Ministry showed there were 4.44 million smokers, with an average daily consumption of 15 sticks per day or 24.3 billion sticks a year. This is against 2011 numbers, which revealed 4.3 million smokers, with an average of consumption of 14 sticks per day, or 22 billion sticks a year. However, Gui notes the reverse is seen in the industry’s volume where the number of legal cigarettes purchased in 2015 had reduced to 10.5 billion sticks versus 13.2 billion sticks in 2011. This translates to about 8.8 billion sticks (or 40%) of illicit cigarettes in 2011 and 13.8 billion sticks (or 56.7%) in 2015. “This goes to show that consumption of illicit cigarettes have increased significantly and this is a pressing issue for us,” says Gui. While he feels that the Government is not achieving its target of reducing consumption, he says more smokers are now turning to illegal brands in the market. Earlier in March, it was reported that the excise duty hike had caused smokers to switch to cheaper contraband brands, causing the Government to lose RM4bil in tax collection last year. Additionally, research also found that 36.9% of cigarettes sold in the country last year were smuggled, which was an increase of 3.2 percentage points from 2014. On that note, local industry players are of the opinion that the current excise hike strategy is pushing more consumers towards illegal cigarettes. The industry is expected to be more challenging in the second half of the year. On the move to implement plain packaging, Gui believes that if this is imposed, it will only make it harder to tackle illegal cigarette trade. “Where purchasing power is concerned, Malaysia is perhaps the least affordable in the world,” he adds. 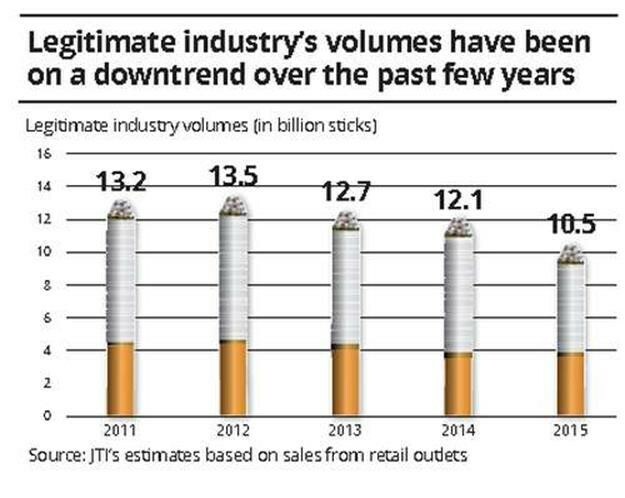 Based on JTI’s volume sales estimates from retails, he reveals that the industry’s volume is expected to decline by 28% in 2016 versus 10.5% in 2015. “This is the biggest decline seen in the industry so far,” he affirms. Meanwhile, the Confederation of Malaysian Tobacco Manufacturers said in March that the legal industry volumes had been severely impacted, registering a significant decline by about 30% post the unprecedented excise hike. It said excise revenue collection would be considerably lower than before November 2015. Despite the challenges ahead, JTI has no plans to shut down its manufacturing plant in Shah Alam, as it is the regional hub and exports to 10 countries. “Since it is the manufacturing hub for other countries, it has enabled JTI to compensate for the volume loss experienced so far in Malaysia,” Gui affirms. With the rising number of smokers switching to vaping, Gui believes that although the industry is legitimate, it should be regulated. Perturbed with the gloomy outlook in the second half of the year, Gui urges the Government to adopt a “wait-and-see” approach for the industry to stabilise prior to imposing another round of tax hike. “We usually notice a strong decline in volume whenever a tax hike takes place and then it recovers a little. But we have not seen any recovery since the 36% hike last year,” he frowns. JTI Malaysia is the country’s second-largest tobacco firm, with a market share of 20.7% as of May.